The LittleBigPlanet community has been busy. Sony and Media Molecule arguably took something of a risk in investing in LittleBigPlanet. While the game boasted a built in series of levels that were entertaining enough on their own, the core and longevity of the experience depended entirely on gamers liking the game and establishing a community large enough to make the title's mantra of "Play, Create, Share" worthwhile. You might say the gamble was a success. Countless gamers have embraced LittleBigPlanet and its sequel and, according to a release on the PlayStation Blog, have since used the games' creation tools to fashion more than eight million unique levels. 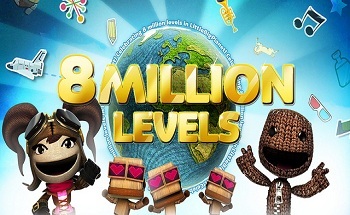 "LittleBigPlanet continues to burst with awesomeness and pure creativity as we now have more than 8,000,000 community levels," said Steven Isbell, the community coordinator for LittleBigPlanet. "We're heading towards LittleBigPlanet's 5th anniversary this year, and the community is still growing strong." While Isbell doesn't say so directly, the eight million levels are presumably spread across the various versions of LittleBigPlanet. This would include the PS3 releases, PSP title and the Vita game released last year. Also, while eight million unique levels is certainly impressive, it's probably fair to assume that not every one of them is top tier in nature. None of this is at all to try and diminish the genuine accomplishment the LBP community has achieved, but it's still good to put forward a bit of context before giving yourself a "pat on the back" as Isbell suggests. Regardless, the fact remains that, at this point, you could pretty much buy a LittleBigPlanet title and never need another game again.